RUSSIAVILLE, Ind. – Tough losses can linger in a player’s memory and motivate a sports team. For the Western Lady Panthers, that is exactly what happened after losing the 2013 sectional title game to Benton Central on the Lady Bisons home floor. One year later, in the friendly confines of Richard Rea Gymnasium, the No. 6-ranked Panthers avenged the loss and defeated No. 8 Benton Central 43-33 to claim the 2014 IHSAA Class 3A Sectional 20 championship. The win sends the Lady Panthers to the Sweet Sixteen and regional competition for the second time in three seasons. Two years removed from a Final Four appearance in which the Panther seniors were a key part as sophomores, the squad found itself on the ropes in the third quarter after going more than eight minutes without scoring in the first half. Down 17-14 at the break, four minutes into the second half the Panthers looked out of sync and were struggling. But then, out of the blue after shooting 26 percent in the first half, Jessica Givens hit a 3-pointer. As did Caitlyn O’Neal. Then Carly O’Neal hits one. And Caitlyn hit her second of the quarter. By the end of the third quarter, the Lady Panthers regained the lead and looked in charge – thanks in part to a full-court defense that forced nine Bison turnovers in the stanza. She said the defensive pressure was a definite catalyst for the offense that started clicking in the third period. Aside from the defense, which forced 28 Benton Central turnovers, Keisling pointed to the home crowd as being a huge factor in the victory. He credited the Panthers student-section with being loud and vocal when needed. Carley O’Neal led a balanced scoring attack with 13 points and five steals, while Caitlyn dropped in 10 while grabbing five rebounds. Durbin had eight points and four steals, Raven Black had six points and five rebounds and Givens had four points and four boards. All but two points were scored by senior starters – sophomore Sarah Connolly had Western’s other bucket. Earlier in the week, Western knocked off Northwestern in the semi-finals. Western’s defense forced 30 Purple Tigers turnovers. Durbin led the way with 14 points while Carley O’Neal added 12. Givens grabbed eight rebounds. Sophia Beachy led Northwestern with nine points while Brooke Treadway grabbed eight boards. Class 3A Rochester Regional on Saturday: 10:30 a.m., Kankakee Valley (15-6) vs. Griffith (12-10); 12:30 p.m., No. 13 South Bend St. Joseph (16-4) vs. No. 6 Western (19-3); winners meet in the championship game at 8 p.m. Sports Journal prediction: Western over Kankakee Valley. In the Class 2A Sectional 39, it took a heroic effort from Kacie Juday to propel No. 5 Tipton to a 65-61 sectional championship victory over No. 14 Elwood. Juday, who is the two-time defending IBCA/Subway District 2 Player of the Week, might earn a third after pouring in a school-record 38 points in the title bout. The Stony Brook recruit had 26 points in the second half after her squad trailed 27-24 at halftime. Down the stretch, the Lady Blue Devils hit 10 of 14 free throw attempts to seal its third sectional title in four seasons. Earlier in the tournament, Tipton topped Eastern 61-32 in the opening round while Elwood ousted Taylor 62-45. Class 2A Lapel Regional on Saturday: 10 a.m., Shenandoah (16-4) vs. No. 5 Tipton (16-4); noon, Southmont (14-9) vs. No. 4 Wabash (19-3); winners meet in the championship game at 8 p.m. Sports Journal prediction: Tipton over Wabash. In the Class 4A Sectional 7 at Logansport, the host Lady Berries topped Marion 66-52 to repeat as sectional champions and advance to Memorial Gymnasium for the Kokomo Regional. Miss Basketball candidate Whitney Jennings closed out her Berry Bowl career with a 28 point, nine assist, eight rebound performance. Junior Nakeya Penny added 21 points and seven rebounds while Sydney Bullard dropped in 10 points. After receiving a bye, Kokomo fell to Marion 52-46 in a Friday night semi-final contest. The Lady Giants jumped to a 15-7 first quarter lead and held off several Kokomo rallies to end the Lady Kats season. Alanis Jones scored 15 points to lead Kokomo, while Jasmine Love dropped in 10. Allie Lowe grabbed a game-high 11 rebounds. Class 4A Kokomo Regional on Saturday: 10 a.m., No. 4 Homestead (23-1) vs. No. 14 Fishers (20-4); noon, Fort Wayne Carroll (10-12) vs. No. 11 Logansport (22-2); winners meet in the championship game at 8 p.m. Sports Journal prediction: Homestead over Logansport. 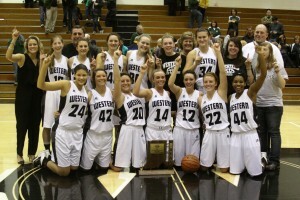 This entry was posted in IHSAA, Western. Bookmark the permalink.